VGA webinars are a benefit of membership in the Virtual Genealogical Association. Not yet a member? JOIN VGA TODAY! 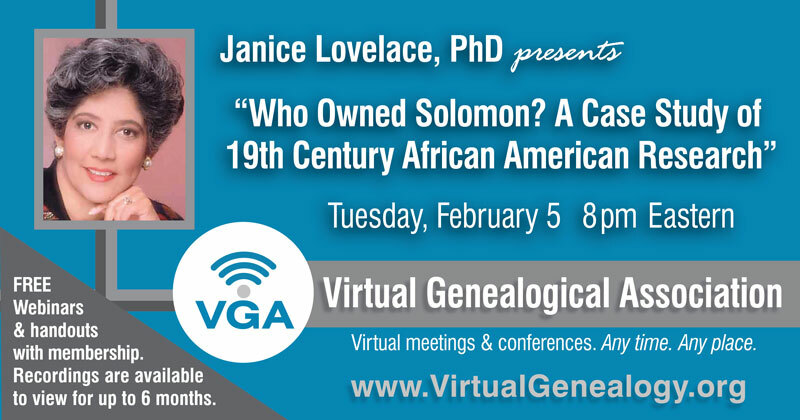 Janice Lovelace, Ph.D. is a genealogical researcher, author and lecturer, with over thirty years of experience. Dr. Lovelace is a frequent speaker at national and regional genealogy conferences on health and genetics, ethnic minority genealogy, and research methodology. She authored the National Genealogical Society’s continuing education course African American Roots: A Historical Perspective and is an instructor at the Midwest African American Genealogical Institute (MAAGI). All webinar recordings and handouts are available to VGA members for up to 6 months from broadcast. Visit our Events Calendar to add this webinar to your own calendar.